Ever wonder why Nintendo's iconic Italian mascot has so many games under his belt? It's because a young Shigeru Miyamoto designed him with that goal in mind - well, sort of. Iwata: So the entire design was a case of form being dictated by function. You can really see that your specialist field, industrial design, is evident in the final result. Then, because he jumped up and down, he became known as "Jumpman", right? Miyamoto: Well, I called him "Mr. Video". My plan was to use the same character in every video game I made. Iwata: So you had that plan right from the start? Why did you intend to use him in every video game you made? So there you have it, folks. Shigeru Miyamoto wanted a character he could use in every game he ever made, though thankfully he apparently (mostly) changed his mind - in that regard and on the character's name. I actually really enjoy these little chat sessions between Iwata and Miyamoto, because not only do they give the two Nintendo bosses a chance to display a bit more humanity and personality than they might get through simple interviews and statements, they always reveal some really interesting stuff about gaming's most storied franchises. For example, did you know that Donkey Kong was originally designed as a Popeye the Sailor Man game (presumably with Popeye as Mario, Bluto as Donkey Kong, and Olive Oyl as the damsel in distress)? 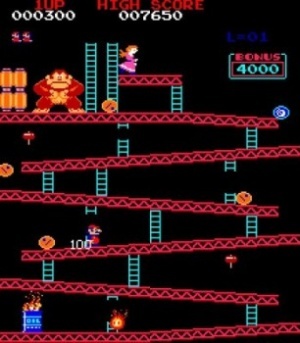 How about the fact that the plumber (well, carpenter in Donkey Kong) couldn't even jump at first? Or that Miyamoto originally wondered if he could patent the idea of a game in which the character jumped, and that Mario 64 was originally designed with a multiplayer component? There's all that and a ton more on the Wii website.